Back in February, Fido informed customers their FidoREWARDS program was coming to an end in early April, with a redemption deadline set for July 6, 2016 for most users. In two days, the redemption deadline is coming for most customers, but some will have until July 6, 2018 to redeem, depending on your scenario. 2. For those on Fido plans that do not earn FidoDOLLARS, but have a balance, they will have until July 6, 2016 to redeem these dollars. 3. If on April 6, 2016, you’re on a term agreement that earns FidoDOLLARS, “you’ll no longer earn FidoDOLLARS as of the end of your current term,” and will be able to redeem these rewards until July 6, 2018. 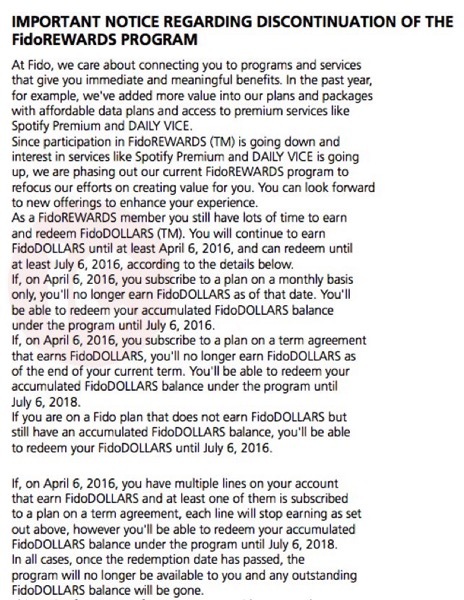 The FidoDOLLARS program was actually pretty decent for accumulating some savings towards device upgrades with the company, but the program is long gone now. Let us know what you’re going to redeem your Fido dollars balance for in the comments below.